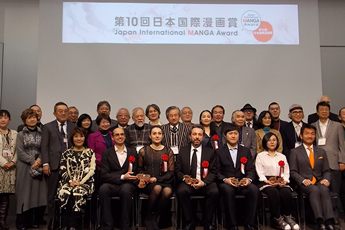 At the 10th Japan International MANGA Award, among 296 entries from 55 countries and regions, 14 works were selected this year, including one Gold Award work and three Silver Award works. On February 6, the 10th Japan International MANGA Award Ceremony along with a memorial symposium and a reception were held at Meiji University, Surugadai Campus. At the Award Ceremony, one Gold Award and three Silver Awards were presented with certificates of commendation by Parliamentary Vice-Minister for Foreign Affairs, Mr. Kiyoshi Odawara and trophies by Ms. Machiko Satonaka, Chairperson of the Selection Committee. Akita Publishing Co.,Ltd, Ohzora Publishing Co.,Ltd., KADOKAWA Corporation, Kodansha Ltd., Shueisha Inc., Shogakukan Inc., Shonen-gahosha Co., Shinchosha Publishing Co., Takeshobo Co.,Ltd, Nihonbungeisha Co.,Ltd., Hakusensha Inc., Futabasha Publishers Ltd., Houbunsha Co.,Ltd., Leed Publishing Co.